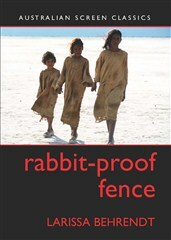 As a Eualeyai and Kamillaroi woman, a descendant of three generations affected by the removal of children from Indigenous families, an award-winning writer and respected academic, Larissa Behrendt brings a powerful personal perspective to this exploration of Rabbit-Proof Fence (Australia 2002). In the opening chapter, Behrendt writes candidly and in the first person about the way the film reflects her experiences. The significance of the film is linked to Bringing them home: The ‘Stolen Children’ report of 1997, the Australian Federal Government’s landmark investigation into the forcible removal of Aboriginal and Torres Strait Islander children from their families. The author notes that “while that report went some way to raising awareness of the issue within Australia … Rabbit-Proof Fence …took the journey of the stolen generations to the world”. The stories behind the film are as remarkable as the book that it is based on. First published in 1996, Doris Pilkington’s Follow the Rabbit-Proof Fence records the experiences of fourteen-year-old Molly, who sets out on a 2000 kilometre desert trek back home with her younger sister and her cousin after white authorities have removed them from their families. Molly was Doris Pilkington Garimara’s mother and Doris, too, was separated from her mother. The stories of Phillip Noyce, the director, and Christine Olsen, who he dubbed ‘the crazy lady’, are here too. It was Olsen who was convinced that the film had to be made, that it could be made only by Noyce, and who doggedly pursued him to make it. Noyce turned his back on a multimillion dollar Hollywood project to make a film that he was told would never be funded “because Australians didn’t want to see films about Aboriginal people, that … non-Australians would not be interested in either”, a film that would be impossible to cast, with a screenplay written by someone who had never written a screen play before. Noyce’s credentials as a director with empathy for Aboriginal stories and Aboriginal people are established in a brief discussion about his first feature film, Back Roads (Australia 1977). The middle section of the book is devoted to how casting decisions, the cinematography of Chris Doyle and the music of Peter Gabriel enhanced the impact of the film. The most difficult task was to find three children to play the lead roles and to create the conditions where they would feel comfortable on set. Kenneth Branagh was cast as A. O. Neville, the Chief Protector of the Indigenous people of Western Australia. Branagh’s observations about Neville are insightful and ensured that Neville was not “simply an evil caricature”. Behrendt comments that Neville “is used not simply as a character but also to portray a set of ideals”. What follows is a detailed analysis of visual, aural and metaphorical symbolism in the film. The meticulous and scholarly examination of scenes and characters from an Indigenous perspective makes this book a valuable resource. The final chapters deal with reactions to the film and its legacy. The reactions within Australia are linked to responses to the Bringing them home report, including the response from the conservative government that was in power by the time the report was released. Behrendt is resigned to the fact that the report and Rabbit-Proof Fence were always going to be caught up in the ideological battle between the “black armbanded” and the “white blindfolded” in the so-called “‘history wars’” in Australia, but she seeks shades of grey rather than getting stuck in the trenches. One area that Behrendt is not grey about is whether we are repeating the same mistakes through measures such as Federal Government Intervention policies in the Northern Territory, which apply only to Aboriginals. There’s a round-up of the critical response to the film overseas – Roger Ebert compared the film to Schindler’s List (USA 1993) – and in Australia – A. O. Neville’s son was angry about the way his father and the mission are depicted. In answer to this, Behrendt notes that Neville was always going to be represented through the eyes of the girls, who were determined to defy him to be reunited with their families. Although policy decisions drive the action, Behrendt insists that the essence of the film is in Doris’s universal story “about the strength of family and the connections to community and country”. There’s a lot packed into these 96 pages, including notes, a bibliography and film credits.